In developing the brief for this contemporary architecture, it was suggested that the agricultural history should influence the proposed siting and the dwelling should be informed by the local materials, unique location, context and history. utilitarian and agricultural buildings. The contemporary architecture proposals were developed taking reference from all of the surrounding properties including the traditional and more modern agricultural buildings, traditional forms, proportions and details etc. We were keen to establish good connections between the occupiers and the buildings and external spaces, creating a sense of place and safety. Flexibility for the contemporary architecture design was also a key consideration so that the building can be adapted to suit the on-going needs of the occupiers and to create an accessible building and as such meeting the Lifetime Homes regulations were proposed. An energy efficient building which maximises the natural resources (orientation, daylighting etc.) while minimising the need for fossil fuels was also paramount to the brief. The form of the contemporary architecture dwelling was influenced by the nature of the simple forms and massings of the area as well as the traditional barns in the area. The initial contemporary architecture concept sketches sought a larger simple form with attached smaller scale and height elements, with the connections of the two elements expressed. It was felt that these two forms were treated separately so that the main element was the dominant form with the additions seen as insertions into the main form and therefore elevationally treated with different materials and proportions. 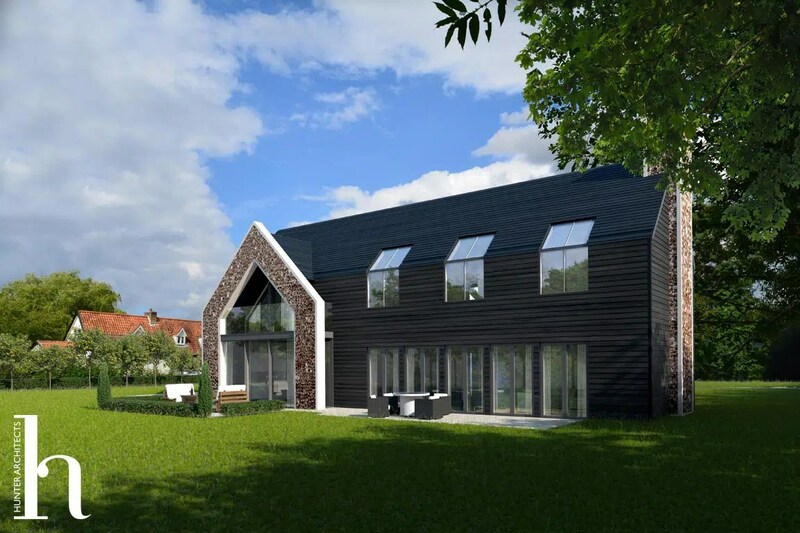 The positioning of the garage element was carefully considered, regarding its impact and scale in relation to the house, the movement of vehicles on site and to provide a visual barrier between the proposed and existing houses. Internally, the contemporary architecture dwelling has been orientated with the main living spaces benefitting from access to the rear private amenity space, views over the remaining part of the site and the afternoon sun. The ancillary spaces, such as the servicing spaces are located to the outer line of the dwelling and on the generally non-dominant elevations and cooler sides. The Master Bedroom suite is located over the main family room as these two spaces generally are the more dominant spaces within a house, and the elevational treatment have similar requirements. Elevationally the contemporary architecture designs reflect the simple agricultural and utilitarian nature of the existing buildings within the area, with a contemporary architecture take on the traditional agricultural barns. A hidden gutter detail and repeating slot windows provide a contemporary and crisp take on the traditional buildings and from a distance will provide a pleasant and complementary aesthetic to the site. to the garden and the contemporary architecture of the elevations reflect this. When analysing traditional building forms, particularly barn conversions, they are typified by simple forms and simple, large openings or smaller repetitive openings, which are generally reflected in the proposed elevations. Features: Family home, natural materials. Contemporary architecture design. Garden Room, open countryside, rural design.